“BEEP. BEEP. BEEP.” The sound is Briana’s Dexcom alarm alerting me that her blood sugar is low. 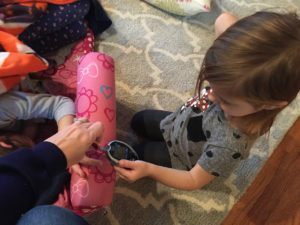 Briana has type 1 diabetes and the Dexcom helps us manage her blood sugar. Before my feet make it to the floor, I hear the shuffle of little feet and Briana’s two-year-old sister, Sierra, exclaim, “Uh, oh! Bonna’s low! She needs to eat!” Despite only being two years old, her sister is on top of it. She runs past me, grabs the glucometer off the counter and runs back to the playroom where Briana and their brother Brayden are watching T.V. When I get into the playroom, I see Sierra is ready to help. I let her place the test strip in the meter and collect the blood with it. Then watch her eagerly await the numbers to pop up on the meter screen, so she can try to read them off. I honestly believe my two-year old is learning her numbers by reading off her older sister’s blood sugars. “Eighty-six. Bonna needs to eat,” she exclaims as she wipes her older sister’s finger off with a tissue. Sometimes, I think Sierra understands diabetes more than her less-than-interested older sister who actually has it. “She needs a Go-Gurt,” Sierra concludes as she rushes out of the room to the refrigerator. This scenario occurs frequently. 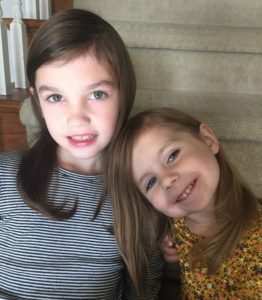 As a parent of a child with type 1 diabetes, similar to many of you reading this story, I am often exhausted by the management. Especially with younger children who can’t or aren’t quite ready to do it themselves. Although I am fortunate to be able to stay home and take care of our kids, my husband works two jobs which both require weekends and overnights. This places a lot of responsibility on me. Just my type 1’s care alone can fill the day and night: communicating with secretaries at school throughout the day to treat blood sugars, counting carbs, measuring, weighing and cooking meals, administering insulin, night time corrections followed by nighttime feedings, the list is endless. Having Sierra to help, even though she is so little, eases the burden just a little especially when my husband can’t be there. She may not fully understand what her big sister is going through, but Sierra knows what needs to be done and is happy to assist. She considers herself in charge of monitoring and she can easily pull up the app on my phone, read off the numbers (with some help) and even tell me which way blood sugars are trending. 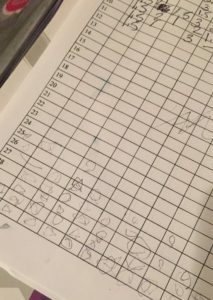 On the diabetes home log, you’ll find Sierra’s scribbles at the bottom where she has “charted” all her big sister’s numbers. Although Briana is not as motivated to manage her diabetes care right now, seeing her face light up when her little sister is fumbling with her meter or giggling as Sierra is yelling through the house about checking sugars or getting something to eat, gives me hope. Sierra helps make this T1D life just a little bit easier, a little bit less stressful and brings us all a little bit closer. There is a saying that sisters are like angels, they sparkle twinkle and glow, they are the greatest gifts our hearts will ever know. It warms my heart to know that they have each other!